Are you someone who pays attention to your socks? You don’t really want to have cold feet while you’re on the trail, do you? 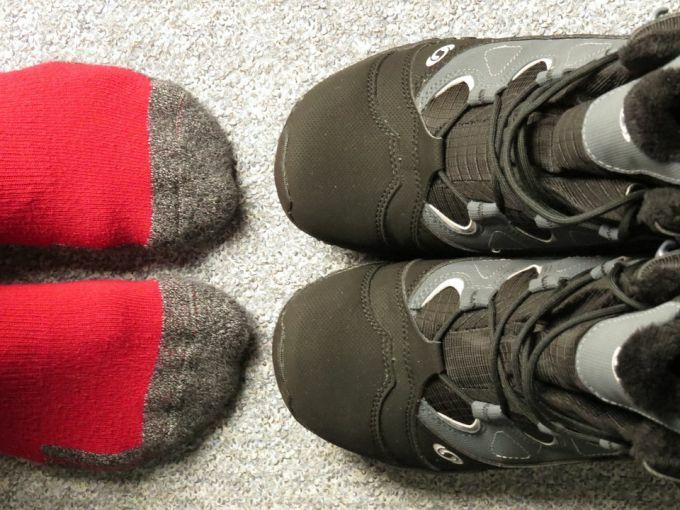 For campers and hikers, choosing the best warm socks is important. With every step on the trail, the right socks play a crucial role in keeping your feet warm and comfortable. We just cannot stress enough the importance of a warm pair of socks for outdoor use. As mentioned, they keep your feet dry and comfortable, and prevent blisters and hotspots. The best socks in terms of comfort and performance can be pricey but they are surely worth it for trail-duty. However, choosing a pair of socks can be trickier that most of you can imagine. Fortunately, we have prepared a guide that will help you with your shopping quest. In this article, you’ll learn which are the most important features that you’ll have to take into account when choosing a warm pair of socks. Plus, we take a look at some of the most popular pairs that you can buy in the market these days. Let’s take a closer look! Just buying any warm socks does you no good. You need to set a criterion that must be met by the potential socks to be bought. Before you swipe your card at the stores, ensure the pair(s) of socks has the following features. They could vary based on your requirements, but the bottom line is that the warm socks should actually keep you warm. Your feet are covered with numerous sweat glands. This makes it sweat a lot. Therefore, the socks material should be able to handle and disperse the immense amount of sweat and keep you warm for the longest time possible. Here are some of the commonly used materials in warm socks. Merino wool: This is the most recommended material for warm and high-performance socks. It is comfortable, highly breathable, wicks moisture amazingly well and does a good job of regulating feet temperature. These socks would also take longer to start stinking. Silk, Ingeo, synthetics and cotton: All these other materials do not perform as well as the merino wool. However, they may vary on durability, prices and general comfort. You should avoid cotton if you are going to get exposed to a lot of moisture. It gets wet easily and retains that moisture for the longer. Various socks come in a number of thicknesses to suit your different needs when you need to be kept warm. The thickness ranges from ultralight, lightweight, midweight and so on. You might be tempted to think that thicker is always warmer. That is far from the truth. The insulating properties depend on the material it is made from. If you are going to wear shoes too, then a pair of socks which is too thick would restrict blood flow in your feet. You should be able to wiggle freely in the shoes. For home use that does not involve shoes, thicker ones could be better. Even in extreme cold, your feet are bound to get sweaty. The accumulation of sweat causes your feet to smell. This smell makes you and your friends very uncomfortable. Good socks should be able to eliminate the bad odor by having anti-microbial agents to keep your feet fresh throughout the whole hiking experience. As expected, socks with this feature will also cost you extra. Taking care of the socks should be very easy. The socks should be easy to wash and dry very quickly. Merino wool socks fall in such category, unlike cotton socks that take ‘centuries’ to dry. The merino socks can be thrown into your dryer with your other clothes, although this is not recommended as it shortens their lifespan. Line drying is the most suitable method to extend their lifespan. Some socks are more comfortable than others due to the various levels of cushioning given to them. The sock has to minimize the stress it exerts on your feet so that you can go that extra mile in the snow. The material also has a big impact on how comfortable the pair of socks is. Wool socks are very comfortable and can absorb a high amount of moisture. There are many good warm socks out there. These reviews will make deciding which socks to buy an easy task. The reviews will also give you a broader perspective of what to expect when buying your dream pair. Let’s get started! Description: The People Socks Antimicrobial Crew Socks are high-end woolen socks that you can acquire at cheap prices. The crew style is well suited for outdoor and indoor activities such as cycling and hiking. If you need comfortable, durable and thick socks, then this could be your best bet. These high-quality socks contain Australian Merino wool. This guarantees you unrivaled quality, comfort and durability. Merino wool is known to have super moisture wicking properties. This leaves your feet dry even in extreme cold. Taking good care of your socks guarantees you a warm, long service. You should cold wash these socks when turned inside out. You should then air dry them on the line and then tumble dry under low heat. This washing with care ensures the socks last longer, giving you more value for your money. These socks are made from combining materials such as merino wool, nylon, polyester and spandex. Wool provides the wicking and moisture handling properties. Nylon and polyester provide the strength and durability. They are also responsible for the quick drying of the socks. Spandex makes the pair of socks extensible so that it can return to its original shape after washing. Related: These awesome socks can make you yearn for more. The 4 pairs that it is available in means you always need more. This is especially when going for an outdoor activity and you need to carry extra pairs for those “just in case moments.” A good alternative could be the Fun Toes Merino Wool Socks, which are available in 6 pairs. With these socks, you’ll always have enough socks to keep your feet warm even if a pair gets wet accidentally. Description: The Heat Holders Thermal Socks are made to make you feel warm during the coldest of days. 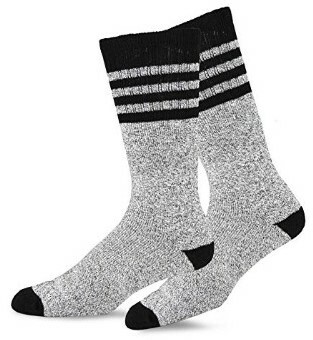 These socks are designed for men and are 7 times warmer than the basic pair of cotton socks. The specially developed yarn (thermal) provides very high insulation against cold. They also give you superior breathability even when moist. This product generates a unique layer of the pile to trap warm air. This keeps your feet comfy and supported during the day. The inside of the sock is taken through an expert brushing process, which provides an exceptionally soft inside. The softer inside then maximizes the amount of warm air trapped inside the sock. This makes you feel warmer as this layer is in contact with your skin. The extra long looped pile structure contributes to a bulky structure that traps more warm air. This product has a thermal resistance rating of 2.3 togs. A basic cotton sock has a rating of 0.33 tog, so they are seven times warmer than the average cotton socks. The 4 materials from which the pair of socks is made ensures versatility in performance. Related: This product is specifically made for men. What do you do then if you want your other half to enjoy the same warmth that this product guarantees you? Well, look no further than the Heat Holders Women’s Socks . It provides you with a warmth rating of 2.3 togs just as the one for males. The pink color is quite appealing too to ladies. Specific features: Mid-weight, mid-calf height, machine wash, tumble dry, merino wool, abrasion resistant, odor repellant, stabilizes the foot, for men only. Best use: Sleeping, hiking, cycling, everyday use. Description: The Carhartt Comfort Stretch Socks are made from the super soft merino wool and the abrasion resistant Coralast fibers. This eventually leads to the production of long-lasting and ultra-comfortable socks for work. This product has a revolutionary comfort-stretch top that yields to the shape of the leg. This ensures that it does not fall, pinch or bind to your leg. This gives you the much needed ‘never know it is there’ kind of feel. When attempting to keep warm, a sweaty foot is your worst enemy. As sweat accumulates due to the presence of the socks, a poorly engineered sock would become wet as well. This might render it useless. However, this amazing product is none of those. It uses the FastDry Technology to wick away any sweat from your feet as soon as it forms. For more convenience during use, these socks fight off all the odors that your sweaty feet produce during the day as you work. Keeps falling in some instances. Related: The No-show socks are really cool to have, more so during hot weather. They eliminate the high-stress socks impose on your calf as you walk around. They also reduce the bulkiness inside your shoes, allowing you to go about your business peacefully. If you need one, the Under Armour No-Show Socks could be a good product to consider. Description: The Smartwool Over-the-Calf Socks are made using the WOW (Wool-On-Wool) technology to create a comfortable pair of socks that is both durable and fit for lots of outdoor activities. They are heavily cushioned to ensure adequate shock absorption, insulation from weather elements and support when having weighty loads. For more comfort, a flat knot toe seam is incorporated for an all-day comfort. This pair of socks is probably designed more for those who go hunting now and then. The merino wool provides for an odorless pair of socks and regulates the temperature, hence performance. Indestructawool technology is used to provide durability. The elite fit system incorporates two elastics for a greater stretch as well as recovery for that awesome fit you love. It would still fit you even after slipping them off. Features such as cushioning, Achilles strap, virtually seamless toes enhance the comfortability of the socks. For hunters, the height of this pair of socks can be extended to accommodate various hunting boots. Its antimicrobial properties eliminate any foul odor from your feet. Related: Are you a lady and have been smitten by this men’s type of socks? Are you a mountaineering enthusiast? If you fall into these categories, you have something to smile about. This type of pair of socks is also available for you ladies. You can enjoy the benefits of the extra heavy and extra warm crew socks. The Smartwool Women’s Socks meets all your needs. Description: The Soxnet Eco-Friendly Socks are an eco-friendly thermal pair of socks made from recycled cotton, talk about something for the environmentalists! The foot and leg of these socks are fully cushioned to absorb all the impacts on your feet. This makes it easy to walk around in the cold. Any impacts on your numb feet could be very painful. These socks are meant to be worn under boots for maximum impacts. The polyester, cotton and spandex materials mixture makes this product very flexible in its properties. Cotton is good at keeping you warm when it gets cold, just do not expose it to too much moisture. Polyester is strong and increases durability as well as care. The spandex makes the socks elastic. It fits right back after washing or slipping it off. Overall, it is a great pair of socks that come at a wonderful price. Related: A skull cap and scarf is what you need when preparing for the cold. Knitted products trap lots of warm insulating air that keeps you warm throughout. Check out this Men’s Slouchy Beanie Hat for your warmth needs. Description: The J.B. Fields Winter Socks are made for those of you who want a product to keep their feet warm as they spend a lot of time outside in the cold. Do you love winter sports? Well, this brand of pair of socks is perfect for you too. With this product, you get a full cushioning and a heavyweight pair of socks made from the softest merino wool to keep your feet as comfortable and warm as possible even in extreme conditions. These socks have a double cuff so that they can stay up better. They also have arch/ankle support which prevents any slippage and bunching. This product is well suited for the extreme weather. It keeps your toes from freezing at temperatures of -300 C. High-quality merino wool and nylon provides for an easy care of your socks. This also ensures you have an itch-free wear and exceptional softness. The colorfastness properties mean that it will not stain your other clothes during laundry. The zones that are more prone to impacts are strategically reinforced to give superior comfort and protects your feet from external stress. You also get an ankle and arch support enabled by the use of an elastic that is strategically placed for better grip and fit. Related: Always loving an alternative to your favorite pair of socks is the best feeling ever. You could still miss it and choose the alternative and feel just as comfy. The Sox Shop Thermal Winter Socks is knee length high, keeps you warm at -300C and is generally top class and cheap too. Specific features: Merino wool, high density, performance fit, fast action wicking, antimicrobial, fine gauge knitting, no bunching, non-slipping, fast drying, breathable, true seamless. Description: The Darn Tough Over-the-Calf Socks are an integral part of your hunting gear due to their ability to ensure your feet are warm when it is cold during summer. It is also ideal for keeping your feet bacteria and odor free. The merino wool is finely knitted to ensure high density. This high density still delivers a breathable and naturally elastic all weather pair of socks. This product does not stretch out of shape even in its over-the-calf shape. Its high stitch to inch ratio provides a performance fit and eliminates any itches when in use. With the full cushion feature, you get full padding all-round the foot and shin areas. This gives you the support and comfort you need at these places when at any given temperature. To ensure you have an irresistible comfort, these socks use the True Seamless construction technology. For your everyday work needs, you want socks that are breathable and contain microbial properties. You can wear these multiple times, and no one will ever notice or get uncomfortable around you. Related: If you don’t fancy over the calf socks, then the micro crew could be just what you need. It could be that they make you uncomfortable, or your activities do not require such lock socks. The Darn Tough Micro Crew Socks are just perfect. Not too long and too short. The light cushioning keeps you warm while indoors or outdoors and still delivers the smooth performance you love so much. Description: The Wigwam Canada Socks are the thickest and warmest socks from Canada’s Wigwam. These crew socks are engineered to keep your feet warm during the coldest of days. The extra thick pair of socks will be able to withstand anything that Mother Nature can throw at it during winter. These socks have fortified soles, a conventional toe closure and a stay put leg plus top. These features make the socks look rugged but comfortable when worn. When you are going to get caught up in the biting cold, be sure to count on these for that much-needed warmth. The olefin sole provides your socks with the most superior wicking ability. Your feet getting sweaty and wet will make you as cold as hell (pun intended). This sole prevents this from ever happening. The sweat is wicked away as soon as it forms. Overall, it’s a great pair of socks for a great price. Related: There are some of you who are irritated by elastic socks and would love something chunky that is easy on your calf. Besides being non-elastic, the Universal Textiles Chunky Boot Socks are also very comfortable and warm. It fits right into your hiking needs. And that concludes our review of the top-rated warm socks in the market. Investing in the best warm socks can be rewarding during the winter when temperatures are down there in the negatives. The low temperatures should not be a hindrance to your outdoor activities. Once your feet are warm, have something warm on your body too, then you are good. Finding that right pair of socks is the real challenge. Just because it is labeled warm does not mean it actually is. You have to be extra keen and look for the features mentioned earlier in any socks that you want to buy. So, were you able to find a good pair of socks from the products we have reviewed? Or perhaps, you have an old favorite pair that you can share with us? Feel free to hit the comment section below!